There’s a whole big world out there. Here’s how every woman can get out and conquer it-solo. Whether surfing in Hawaii, strolling the cobblestone streets of St. Petersburg, drinking in Dublin, or swimming with dolphins in the Caribbean, women can take on the world and create lasting memories with the best travel companion ever-themselves! 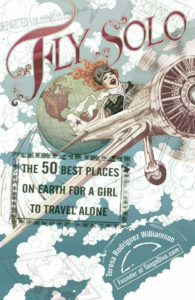 In her first book, TangoDiva.com founder Williamson uses 10 criteria-among them safety, transportation and friendliness-to determine a list of destinations for adventurous women, then provides the skinny on each. But before delving into her exceedingly thorough chick-trip dispatches, Williamson provides an incisive quiz to help readers determine the best trip for them. Dozens of global hot spots are profiled here, with an especially extensive list of European locations. Rating each of her destinations on four important variables-cultural opportunities, activity level, weather and social interaction-Williamson gives readers a feel for each city; true to her insider’s vision, she even dishes out the home phone numbers of American ex-pats willing to offer a home-cooked meal (for a small fee). Other off-the-beaten-track suggestions include trying the Moroccan baths in Paris, and tracking down a bar in Beijing so hip it attracts British DJs-“From Britain!” Even though this easy-to-breeze-through guide offers information on locales as far-flung as Machu Picchu and Tokyo, a number of fun stateside escapes ensures that even “girls” on a limited budget will be ready to lone-wolf it. “An inspiring guide packed with simple steps to empower your life” – Christine Comaford, NY Times Bestselling Author of Rules For Renegades and Smart Tribe. With her bestselling travel guide, Fly Solo: The 50 Best Places on Earth for a Girl to Travel Alone, now available in four languages, author Teresa Rodriguez sets out to inspire others who want to take the leap of doing things alone in Body, Mind, and Solo. In this clever book, Teresa uses travel as the metaphor for change and courage. She gives simple steps to build the confidence you need to do things on your own-be it travel the world, leave a bad relationship, or start your own business. Discover the hope and inspiration you need to follow your dreams. Body, Mind, and Solo gives you the tools to become the powerful person you were meant to be. By following these seven easy steps, you can find strength and knowledge to conquer your fears. Step out into the world with enthusiasm and joy.